In the tale of King Arthur, we find that an unassuming young boy draws Excalibur, despite being a mere stable boy. All the lords in their fine costumes and armour could not draw the sword, despite their power and wealth. In Malta, we are experiencing a similar phenomenon, with the two major parties losing their moral high ground. When the Labour Party was last in Opposition, it promised the world to everybody, and yet in the end, did not deliver. The Nationalists have now been compromised by their efforts to win over big business, having fought to extend the Majjistral Park hunting hours, refusing to obstruct the ITS development or Mercury Tower. People are finally waking up and smelling the coffee with the situation of the St Vincent de Paul ‘direct order’, as it was the Democratic Party that drew the sword from the stone. Regardless of the outcome of any investigations, it was the Democratic Party that once again performed solely as the Opposition, holding the government to account. Since the general election last year, the Democratic Party has had to overcome great obstacles to make its voice heard. Nevertheless, it has succeeded, des­pite not controlling television stations, radio or newspapers. 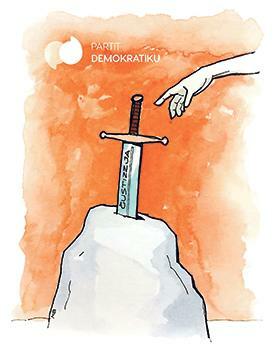 It only has two MPs, and it does not even have the long history or recognisability of Alternattiva Demokratika. In this bipartisan culture, the Democratic Party has not started with the benefit of the doubt. Its enemies have tried to ignore it, and when that did not work, every­thing has been done to attempt to destroy it, including slander. Yet, time and time again, the little Democratic Party rises to the challenge, overcoming tremendous odds, to set the agenda in Parliament. The reason why it punches so far above its weight, as David against Goliath, is that it stands for what is right, and calls a spade a spade. Across previous generations, there has been nobody watching the watchmen in Parliament – nobody to hold both the Opposition and government to account at the same time. Now that such a watchdog has finally arrived, people are beginning to ask questions. Why was the Nationalists leadership silent on ITS, for example? Why do they not talk about tuna pens and slime? Who is funding the Nationalist Party? Similarly, the moral integrity of the Labour Party remains challenged. When the Labour Party betrayed its promises, the Farrugias refused to ride the gravy train. The easiest thing they could have done would have been to remain or join the Nationalist Party, but instead they fight for the third party in Parliament, against all odds. They do so because it is the right thing to do, to bring about real and lasting change. Just as in the tale of King Arthur, it is not wealth, glory or power that is drawing Excalibur. People are realising that the right to govern comes from doing what is right, even when it is unpopular, from saying difficult things, and from fighting against all the odds for a better tomorrow. Timothy Alden is the deputy leader of the Democratic Party.